Notice the difference between the quillon terminals of A479. What happened there? Master did one and left the other to a young apprentice? Finished the right side, then went to lunch and had one beer too many? Wanted to finish before sundown? Started with the left side and didn't get into the groove until the right? It really looks to me like a less-skilled craftsman tried to follow the right side too literally, even going so far as to continue roping left instead of roping right to mirror the opposite side. Looks as if it was either repaired or craftsman didn't care about minor details (or indeed had one beer too much). Even person with average skill could make roping lines parallel. I like the first helmet in the second post. It looks very intriguing, any full pic of that one. All amazing photographs!! Double bravo! Justin: I don't have a full-figure image of the A30 helmet. Once you back away from the glass it's almost impossible to get a decent photo at the WC. However, they do have that harness online. The WC image is below, with their notes. This superb Imperial-quality early-16th century armour, attributed to the master-armourer Kolman Helmschmid of Augsburg, was perhaps made just before his death in 1532; alternatively, the armour may be to the work of his equally-famous son, Desiderius. Both men worked for the Imperial Court and created some of their finest armours for the Emperor Charles V and his son Phillip II of Spain. This particular armour bears close structural similarities to the so-called ‘KD’ armour of Charles V (c.1526) in the Royal Armoury, Madrid, and is certainly of equal quality. The helmet retains part of its original red silk-faced lining, albeit now mostly faded to yellow. It's also covered in the new Wallace Collection catalog of arms and armour (which tends to feature the "treasures" of the collection). First one below is still WC. The others are Royal Armouries-Leeds. Note the black sallet's spring mechanism. The catch appears to formed from the end of the spring itself. Thanks for sharing these, Sean. I have been gone from this site for a long time, but just finished a project that brought me back to share some pics, and I came upon this thread. The project was a re-creation of a dagger from the WC, so your pictures are illuminating and relevant for me in many ways. Here's another big batch from the WC, with best wishes for a good weekend for all! One more, because it's Friday. Wonderful pictures, thanks for taking the time to share them! Do you have more photos of the sword with the black waisted grip and "S" guard? Preferably, do you have one of the blade? not of the whole sword, but i might have something of the top of the blade. i'll check monday and see if wc has it online. It's an estoc. I told you wrong, Craig. That's the estoc shown below. Elegant thing. 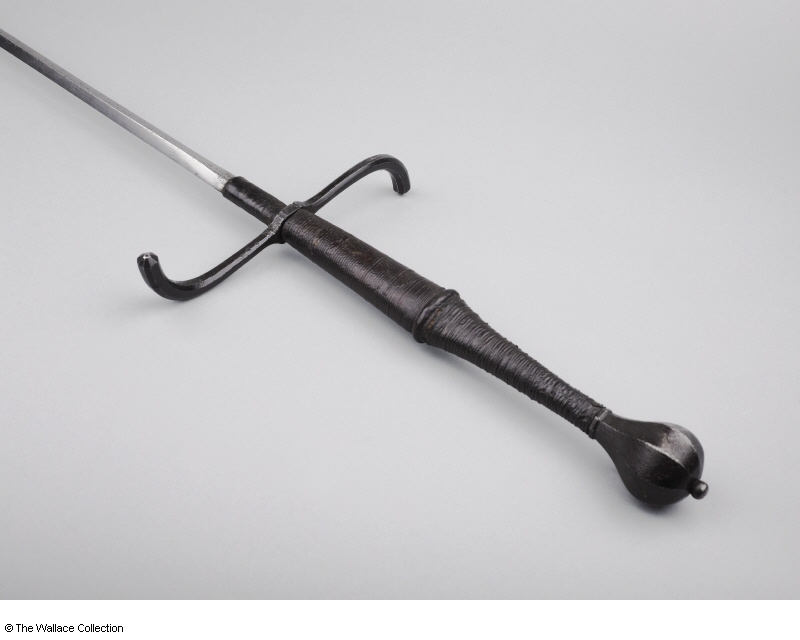 Taking a wild guess, is the second picture in this thread the WC two handed/hand-and-a-half Swiss sabre with complex hilt? If so, would you happen to have any other shots of it? I'd be grateful if you have anything that shows details of the side rings.